I’m not sure about you, but I wash my hands about a gazillion times a day, which means we go through a lot of soap around here! With four of us living in our house, I feel like we are constantly running out of soap. I decided to try making my own foaming hand soap to refill my empty hand soap containers, and was amazed at how easy and inexpensive it is to make your own DIY Foaming Hand Soap! Seriously, people…it doesn’t get any easier than this! 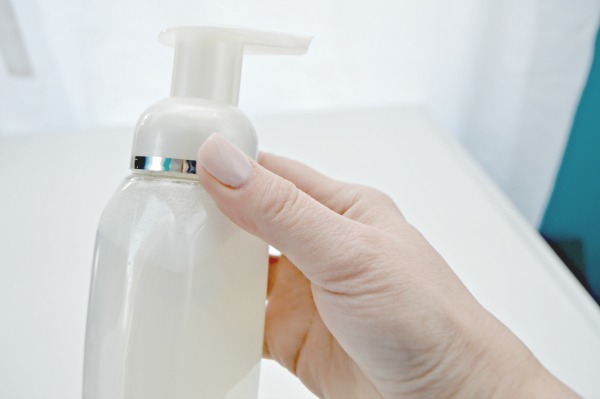 All you need is an empty foaming hand soap bottle (most of them have plastic labels that will come right off), Castile Soap or Dish Liquid, and warm water. 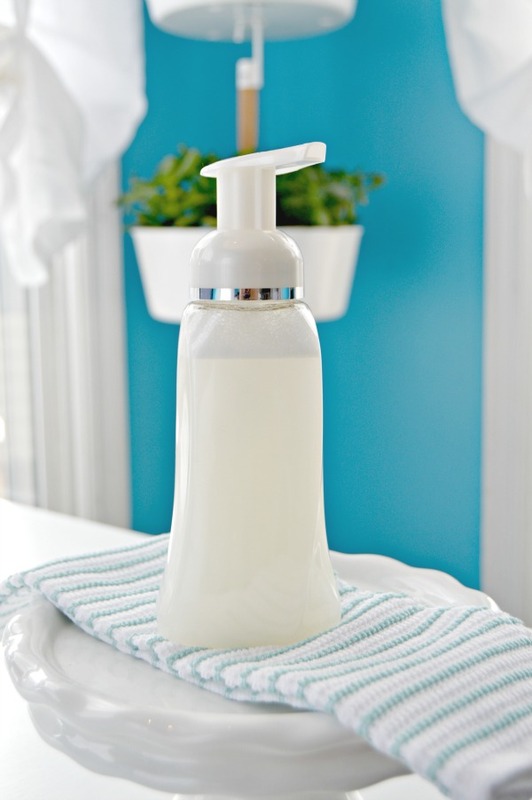 First, fill your hand soap container with one cup of warm water. Next, add one tablespoon of Castile Soap or Dish Liquid. 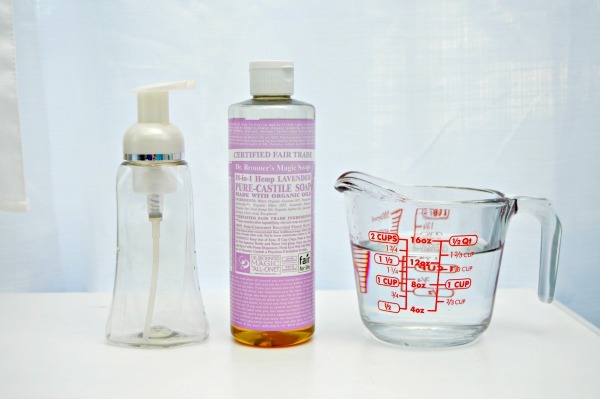 I love Dr. Bronner’s Castile Soap in Lavender, but like I mentioned before, you can use any dish liquid instead. 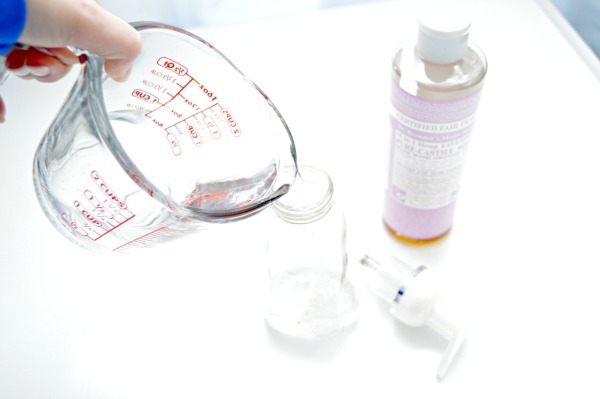 Replace the lid back on your soap container and shake well. Your soap is ready to use! Now, how’s that for saving some money and trips to the store to stock up on more soap? I really wish I had known this trick years ago! While I’ve got you here, I want to tell you about a super fun series I’m doing on Instagram! Starting on January 1, 2016, I am sharing a Tip of the Day there every single day! Some of the tips are from the blog, some of them are exclusively for my Instagram followers, and I’ll be sharing some tips from other sources like Better Homes and Gardens, Martha Stewart and more there! 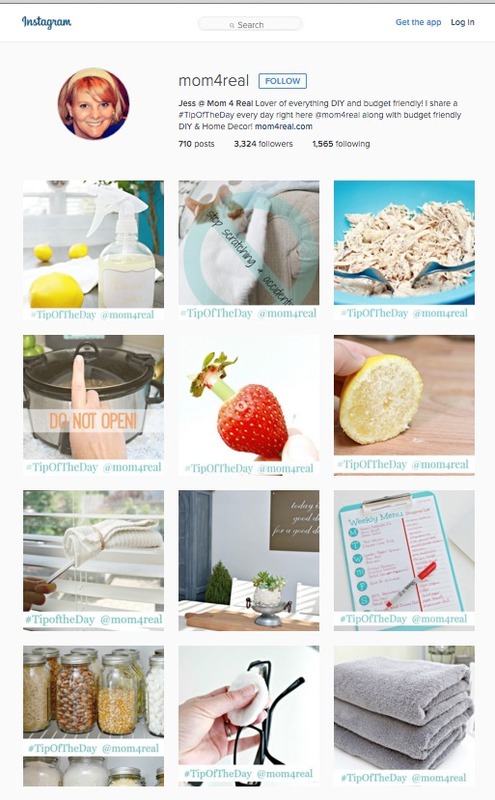 Be sure to follow me on Instagram HERE or search @mom4real on IG so you don’t miss a single tip! 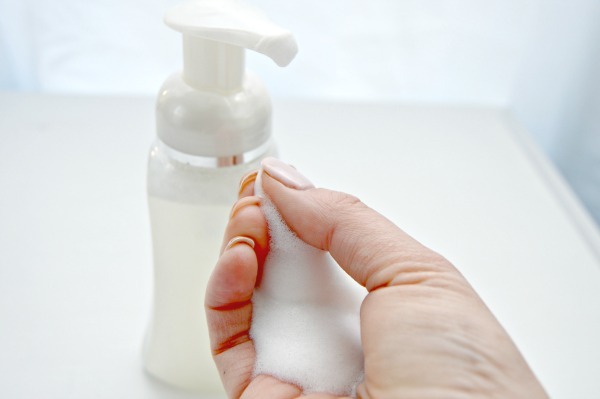 I’ve been re-filling foaming handsoap dispenser for years. I use the economy size handsoap (softsoap). Just be sure you don’t overfill or it won’t work. I read somewhere it’s 1/3 soap to 2/3 water. You are using a lot less soap. Is it still soapy or just foamy? I love your site it has been very helpful to my family…my husband is disabled and I am a 24/7 care giver. So I really have to be frugal being on a fixed income. Your site has been a blessing thank you so very much. I tried your DIY shampoo; but it seems like all I am doing is putting oil on top of oil; am I missing an ingredient?? I know it is not connected to this DIY soap reciepe but I am going to try that too. Please keep your tips coming because as my disabled veteran husband and I age we are always looking for tips to cut costs where we can. Love your site Keep them coming!!!!! I have also been doing this for years. I use Bath n Body regular hand soap. Just put 1 to 2″ of their soap in a old foam bottle from them then fill up with water and shake. Any store bought hand soap will work. from one bottle of B&B soap I can refill my foam bottle about 5 times. Now that is cheap soap! 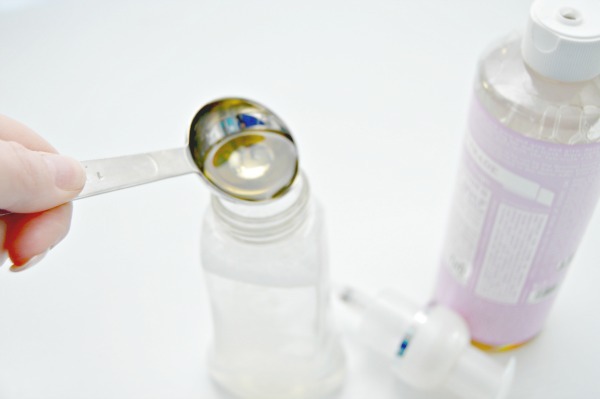 I use the 1″-2″ hand soap method and then add essential oils for germ fighting. HI JESSICA! DO YOU HAVE TO SHAKE BEFORE EACH USE? I add Avon Bubble Bath, works like a charm! Duh – been doing this for years. Even got my dispenser for4 free. Been doing this for years. Glad you put it up on your site. the firmness you want in the foam. Depends on the dispenser. I just saw a photo of your dog, Nash! My parents andI each had a Boston Terrier. They were both so sweet and funny. I love dogs with squishy faces. I never was in to making my own products. But I have tried a few of your receips and they are great. I love when you can add oils for whatever fragrance you want. Will keep reading your ideas. Keep up the good work, it’s the greatest..???? Love, love your site!, Thank you! What a service you are providing!! I have been living in a cave. I just came across your tips. I love Castille soap. I’ve been using it for years. Thank You, for being able to share your great tips to not only save us money. We save the earth too. Yay for us. Hi Jessica, where did you find your foaming soap bottles ? I looked on Amazon, did not like the ones they had…..
also do you know what kind of essential oils you would use in it for germs ? I use Purify from Amazon, which I get at a discount with their Subscribe and Save program. It’s like the traditional “Thieves” essential oil, which is a germ-fighting blend of oils. Smells great, a fresh citrusy-lavender scent. I love your recipes! One question I have is about the foaming soap dispensers for the body wash. Can you recommend a good one that lasts? The one I am using (borrowed from a store bought foaming soap) Doesnt pump out the soap. Do I have to be careful how much I fill up the bottle?